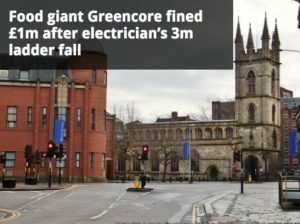 Supermarket supplier Greencore has been fined £1m after a self-employed electrical contractor fell to his death from a height of 3m while trying to install two motors above a machine used to mix sugar paste. The contractor, named in the press as David Shanks, 55, worked almost excl usively for Greencore, which manufactures cakes and desserts at its Hull facility. Hull Crown Court heard that in October 2013, Shanks was instructed to wire a motor situated above a machine. 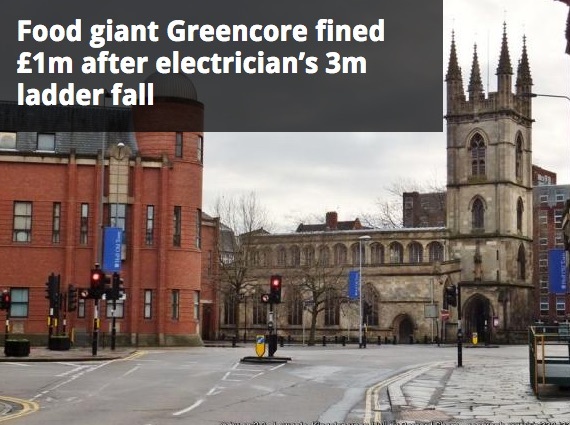 According to the Hull Daily Mail, the project manager for the task provided him with a working at height permit which said that the height involved was 2m when it was actually 3m. Shanks was also given an unsuitable stepladder that didn’t reach the work site, which the HSE described as “totally inadequate”. To enable him to reach, he stood on the lid of the machine that he was wiring. The lid had a counterbalance mechanism, and as he removed his weight to step back to the ladder, his foot caught the counterbalance and the lid opened, knocking him to the floor. Shanks suffered severe head injuries, and was pronounced dead in hospital the next day. Judge Mark Bury, quoted in the Hull Daily Mail, said: “[The project manager] did not seek from, and therefore did not discuss with David Shanks, a risk assessment and method statement, which had he done so would have revealed the ladders he had used were totally inedequate. Greencore Grocery, of the Sutton Fields Industrial Estate in Hull, pleaded guilty to breaching Section 3(1) of the Health and Safety at Work Act and was fined £1m plus £30,000 in costs. The Greencore Group had a turnover of £1.34bn in the year ending September 30 2015. It operates four manufacturing facilities in the UK, supplying own-label products to supermarkets and branded goods under licence, and also has operations in Ireland and the USA. After the hearing, HSE inspector Denise Fotheringham commented: “Falls from height remain one of the most common causes of work related fatalities in this country and the risks associated with working at height are well known.